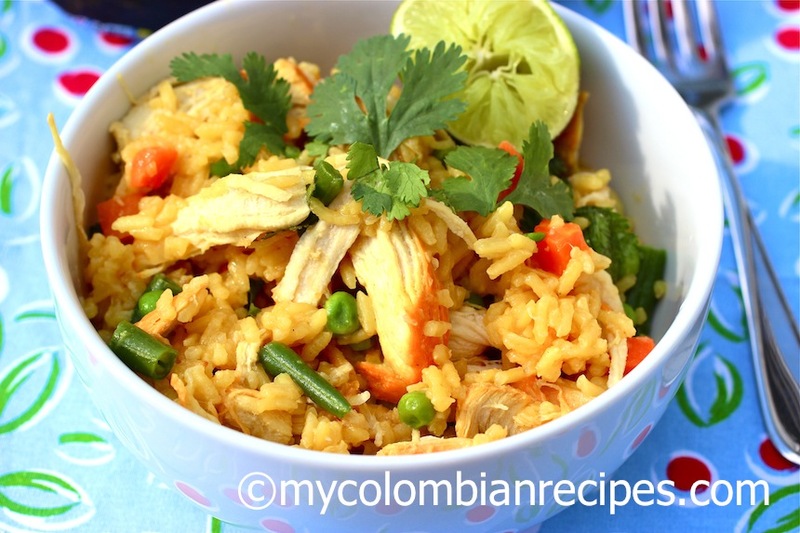 Colombian-Style Arroz con Pollo was one of my favorite recipes growing up. My mom would make it at least once a week for lunch. Rice with chicken is one of the most popular dishes in Colombia and South America, but every country has their own variation. This is my mom’s Arroz con Pollo recipe. Enjoy! Traditional Colombian Dishes: Empanadas Colombianas (Colombian Empanadas), Sancocho de Gallina (Chicken Sancocho), Ajiaco Bogotano (Chichen and Potato Soup), Bandeja Paisa (Paisa Tray), Pandebono (Cheese Bread), Buñuelos (Cheese Balls) and Arepas Rellenas de Queso. Place the chicken breast, 5 cups water and the remaining ingredients for the stock in a medium pot. Bring to a boil, cover and reduce the heat to medium low. Cook for 20 to 25 minutes. Turn the heat off and let the chicken rest in the pot for about 15 minutes covered. Let it cool, shred and set aside. Strain stock and measure 2 ½ cups and set aside. In a medium pot, heat the olive oil over medium-high heat. Add the onions, green peppers, garlic and red bell pepper. Cook until the onions are translucent, about 4 to 5 minutes. Add the rice, tomato paste, chicken bouillon and sazon goya. Stir until the rice is well coated about 3 minutes. Add the chicken stock and bring to a boil. Then reduce the heat to low. Cover and simmer for about 15 minutes. Add the peas, carrots and green beans and cook for and additional 7 minutes, add the shredded chicken and cilantro, mix well with a fork, cover and cook for 5 minutes more. 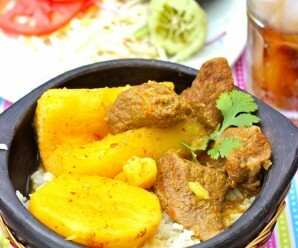 Erica a classical dish from my childhood and today enjoy in the same manner so yummy!! Here is a dish I can totally relate too! Growing-up in Miami this was one of my favorite dishes. This is a soul-satisfying dish. wow Erica, that looks beautiful and delicious, love the combination. Your arroz con polla looks so tasty, Erica!! Very flavorful esp. with the azafron ! ( do you know that saffron is called “zafran” in India?) .. how similar is that! traditional recipe…but an upscale presentation. Very nice, Erica. One of those classic comfort food dishes. Saffron just adds that amazing flavor. Wow! Am I too late for dinner? This looks awesome! Thank you all for visiting my blog!!!! I just discovered your blog and I like it very much. It looks great and it *is* great, but my host family in Bogota 30 years ago served it with jugo de tomate de arbol…even today I can hardly type that phrase. That juice was awful, awful stuff. (In English it’s called a tamarillo, and there’s a good Wikipedia article about it.) I have to break the mental association of arroz con pollo with jugo de tomate de arbol, so I can make the recipe! This was my absolute favorite growing up! The recipe calls for green pepper. Is it green bell pepper, or green pepper as in jalapeno or serrano? I made this dish for my Colombian husband tonight and he LOVED it. I will be making more recipes from your website in the future – Thanks! Annie- thank you so much for your feedback! glad he liked it! Cant wait to cook this dish. I ate it as a little girl, and now thnx to this recipe I get to share it with my family. You should think about putting your wonderful receipes in a book. So, you can make some $$$. I am pretty sure you will be besides rich, you will be recognized as a woman with the Colombian sazon…………..
Love all your receipes and most the pictures, they look so yami and authentic!! Thanks for the post, I stumbled upon it when I was searching things related to chicken coops in Yahoo. It’s not exactly what I was looking for but I picked some interesting things. Thanks again. Hello! I was VERY pleased with this recipe. My husband, who is Colombian, said it was perfect. Thank you. Just a note to others, depending on the kind of rice you use, you might need just a few more minutes of cooking time. I reserved more stock for this case. Kimberly- Thank you so much for your feedback! In this recipe it looks like the rice is already been pre-cooked, am I right? What brand of rice do you recommend? Andrea- The rice is not pre- cooked. I use Canilla or Goya! Erica, soy Bogotana – llevo 12 anos viviendo en NY, PA y ahora MD y le cuento que extrano mucho la comida de mi tierra. La falta de conocimiento de muchos ingredientes no me permitia cocinar recetas Colombianas. Gracias: esta noche ARROZ CON POLLO!!! This arroz con pollo recipe was perfect. My kids love it and it was better the next day. OMG I have been looking for this recipe forever, my husband is Colombian and my son is half and I have been cooking his dishes for years and when I came across this I had to try it and it is the bomb I can not wait till he gets home to serve this dish to him. Thank you so much!!!!!!!!!!!!!!!! 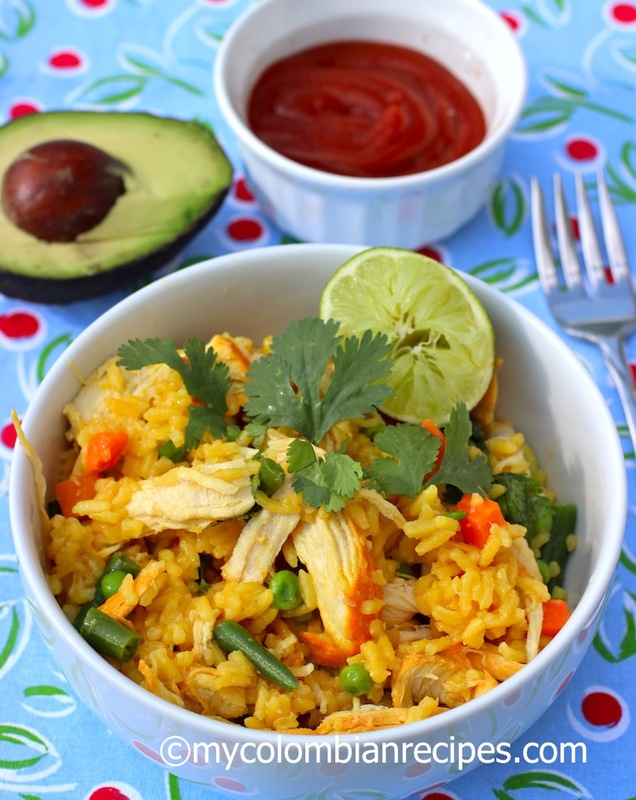 I made this Arroz con Pollo and it was delicious…..better the next day. Thank you. Great recipes. Thanks for this recipe. I looking in every place for arroz con pollo and finally I found. This Dish makes wanna cry!!!! Thank you for showing us to make it. Now I can try to cook it just like my Mom and Grandma’s Colombian dish.I never cook in my life but I can learn!!! So excited to try! Was an exchange student 20 some years ago in Bucaramanga and still think about and miss the food. I was especially looking for an arroz con polo recipe. Thanks so much! Made this today! So good and so easy. Just what I had been missing from my exchange year more than 20 years ago!!! Thank you so much. Bought stuff to make arepas too! Can’t wait to try! For the past few weeks I searched for Colombian recipes and came across your site, this website reminds me of the book Julie and Julia. The photos accompanying the recipes are wonderful; they entice the reader to cook! Tonight I cooked arroz con pollo and loved it!! As I was eating I closed my eyes and felt as I were eight-years-old, sitting at my grandmother’s house eating her food. I added sweet plantains, avocado, and passion fruit juice to complete the dish. I am looking forward to making other of your dishes!! Thank you for having this wonderful idea of bringing our Colombia everywhere, people will be able to see how amazing our food can be! In step 3 when you say “add the rice” is it supposed to be cooked already? Vanessa- No, It is uncooked. I am making this on Saturday…This looks soooo good. Made this for lunch on Saturday and again, it was a home run! 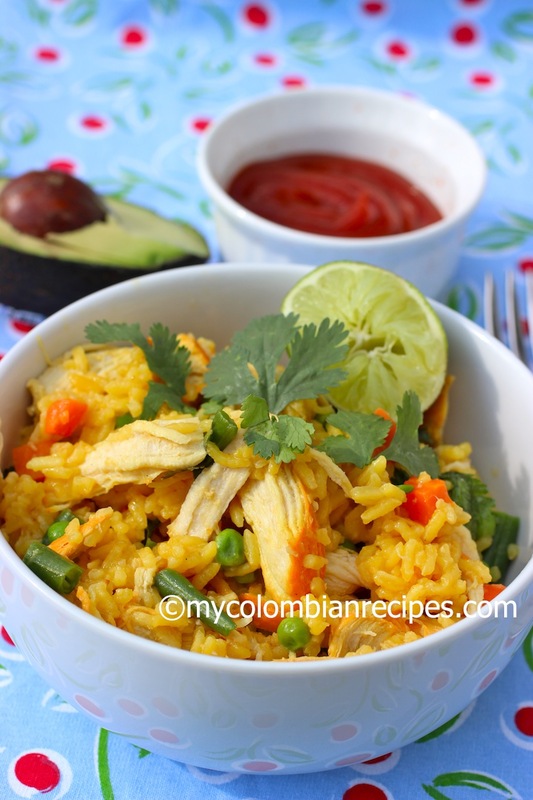 It tastes exactly like the arroz con pollo we used to eat in Colombia and it was so easy to make. For some reason I had to add another 20 minutes to the rice because it was still crunchy when I tasted it. Other than that, it was beyond delicious. Thanks again!! Thank you so much for the recipe. . . 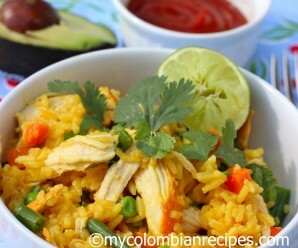 It looks delicious and exactly how I want my arroz con pollo to come out. . . I tried the Arroz Con Pollo recipe twice now. The taste is great but my rice is alwas mushy. What type of rice do you use? Paula- Long grain white rice (Canilla or Goya). You can add less liquid to the rice and it will be drier (about 1/2 cup lees)…..I like mine moist. Looking at your food takes me back home!! My mom is originally from Colombia and I have have been there to visit my family many times. I am married now and want to share part of my culture with my American husband and create new family traditions and this will help! Thank you so much, I can’t wait to try these recipes! Hola Erica ! i` m colombian guy that loves to cook , my wife is american and now she how to make white rice , empanadas and patacones…. but the first time i made this recipe ; she was wow wow …. thanks for share our traditional cousine ! Hola Erica! 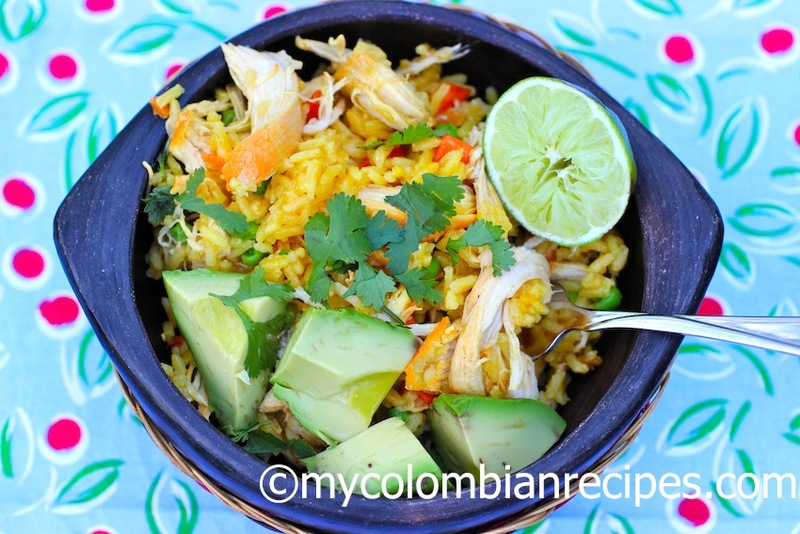 I am so excited about trying your recipe for arroz con pollo, my colombian family is coming to visit and although I am colombian I can’t say I cook a lot of traditional colombian food. I am so glad I found your recipe, cause I was looking to make something delicious,easy and traditional,and I think this covers all of those requirements.!!!!!! Thanks again…..
“I am LOVING your recipes! You are a genius! I made this tonight and it was delish, and I’ve made other recipes of yours as well. it is always perfect. I get lots of complements . Thank you for the recipe, I’m also Colombian! and always enjoyed eating this dish now I’m giving it a go…so far so good, I’m towards the final stage and hopefully my Italian wife likes it because she is a great Sicilian cook. She is looking forward to try it. Hallo, I’m italian, but I have some colombian friends…I wanted to surprise them and cook something from their country..so,thank you for your recipse they are soooo tasty and helped me to learn how to cook colombian food…I hope I can visit Colombia really soon! This is a wonderful recipe and has become a staple in our home! I made this arroz con pollo last night for dinner and we all loved it!!! Delicious and easy to make. Thanks Erica for the recipe, I’m from Medellin and live in California and no one knows about Arroz con Pollo, I will try it next week. OMG!!!! Thank you for posting this recipe, I made it today…..my rice came out a little bit hard, but the taste was DELICIOUS!!! I made this last night exactly as written. As with all your recipes I’ve tried, this was exactly the flavors I recall from my Colombian family. This will definitely be added into my menu rotation. Your blog is by far the best resource for delicious Colombian food. I’m so glad to have found you! Loved it! Easy, quick and great flavor. This will be one I’ll use again. My Colombian son-in-law was recently in an accident & is recovering in my home. I made this recipe for him & he loved it! Three of his Colombian friends came to visit & they each had two servings! My whole family loved it, too! Today I’m making the Short Ribs with Colombian spices in the slow cooker. I can’t wait to taste it as it smells delicious. Thank you so much for sharing your wonderful recipes. This recipe has made my 16 year old son very happy. 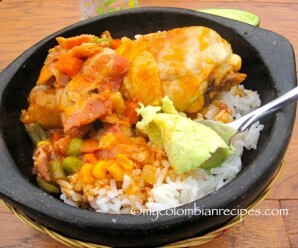 Orroz con pollo was his favorite dish to eat when we were in Colombia this past summer on a missions trip. I’ve used this recipe four times since our return in July. Today, I am preparing it for not just my family but about 75 other people as it is the main dish at our lunch at church today. Thanks for sharing your great recipes with us. Hi Gloria, This is my mom’s recipe and I learned it from her……The chicken is pre-cooked and I used the broth from that chicken to cook the rice. I made this arroz con pollo and I loved it, it tasted like my mom’s rice.Thank you. I’ve tried two other arroz con pollo recipes and they came out OK … I measure my cooking success based on how much food is left over after making a meal. I tried your recipe and it was wiped out clean. It came out delicious but I had to use 6 cups of chicken stock as the rice was drying out quickly. Thank you Erica for sharing your recipes in english. I was born here but my parents are from Medellin. I tried your arroz con pollo and it came out delicious! Hola, soy un estudiante universitario nacido en Colombia y de ves en cuanto me gusta venir a tu pagina y concinar un poco. Todas tus recetas me han salido muy ricas! En esta se te olvido incluir en la receta cuanto arroz, me imagino que 1 1/2? Carlos-Es 1 cup…..si miras bien esta en la lista de ingredientes para el arroz. I made this last night and it was delicious!! Even my 3 year old son ate it right up! Thanks for sharing your family recipes! Keep them coming!! Hola Erica, quisiera hacer arroz con pollo para 30 personas… me puedes sugerir como cambiar las medidas? especialmente para preparar el arroz y que quede bien. Thank you so much for this recipe! I’m creating a Paleo version for a client, which is surprisingly easy. Great authentic flavors! 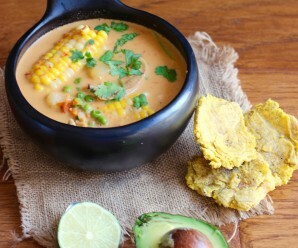 I love trying recipes from around the World and have a new found craving for latin foods.. can’t wait to try this! I was looking for receipe for a pot luck that had it’s origin in South America. This was easy, beautiful to look at and tasty. I could not find the Sazon Goya with saffron, but did find a sazon Goya con cilantro y achiote. It had more of an orange color. Is there a big difference? The flavor was very good. No, I used both and they are similar. I make this arroz con pollo twice a week. It’s my favorite Colombian recipe. Lovely recipe! Any tips of making it for a large group like around 30 people? How much should I multiply the recipe by? Do I add the rice cooked or uncooked? I’m going to make this tonight!!! Hola erica me encantan tus recetas siempre estoy ensayando cosas nuevas y ya he hecho muchas tuyas. Yo vivo en nj con mi familia y la verdad es que la comidita lo transporta a uno . Te quería preguntar algo sobre esta receta de arroz con pollo , haré una fiesta en estos días y quisiera hacerlo pero seria para 40 personas … Sabes mas o menos cuanto necesitaría de ingredientes? Hola Luisa, Esta receta puede servir hasta 6 personas, entoces puedes multipicar los ingredientes por 7. El procedimiento es el mismo, pero debes usar una olla bien grande. I have made this twice and am making a double recipe this time. It is perfect! Has anyone tried making this ahead and freezing? It sounds delicious and I prepare meals for others and would love to make this. If we were to leave the grren pepers off since im making this dish for a class project and a kid is allergic to it would there be any big change in the recipe and taste of it?? No. It will be fine. Hi! What type of rice do you recommend I use? I use long grain white rice. This dish looks absolutely delicious and I am looking to cook it soon. Wondering if you could please clarify the first part of the recipe please? When you say ” place chicken breast, 5 cups water and the remaining ingredients for the stock in a medium pot”, which exactly are “the remaining ingredients” you are referring to? Sorry about the question……. I have tried many of your recipes and they have all been delicious and quite a hit. The last one I made was albondigon. Thanks for the wonderful recipes!! Sorry Ercia you can ignore my message. I just figured it out. Apologies!! Thank you so much to this blog. I don’t know if you still monitor it, but I have a question please. I’m in the UK and cannot easily buy saizon Goya or annatto/achiote. I’d like to make my own seasoning, so what would you recommend I use instead of achiote/annatto please? Thank you for your reply Erica, but I cannot buy ground achiote or annato here in the UK. What would your advice be for an alternative please? I’ve been researching this and was thinking Tumeric and Paprika (not hot, and can’t find sweet! ), do you agree? Thanks again. When you say ” place chicken breast, 5 cups water and the remaining ingredients for the stock in a medium pot”, which exactly are the remaining ingredients you are referring to? I also don’t understand what this means. Can someone explain? Thanks. I have a question. When you list the ingredients, you say chicken AND stock. Is that 2 different things or is it supposed to be chicken stock? Also, in the directions, it says 5 cups of water and the ” rest” of the ingredients for the stock. What are the “rest” of the ingredients for the stock. Those parts were confusing to me. Thanks. I love your website! When I want to surprise my Colombian boyfriend ( I’m Lithuanian) I always come to check your recipes. And today I’m trying this one. I love Colombian food! How does tripling the recipe affect the cooking time? Is there a similar recipie that used shrimp instead of chicken? We just came back from Colombia and kept seeing something similar to this but with shrimp. Wanted to surprise my husband with it since he never got to order it. Thanks! This is my favorite colombian dish and my husband feels like he is back home when I make it!! Thanks for the recipe!